Great American III, a 2000 Open 60, arrived in September of 2006 at MYC for a complete refit in preparation for the 2008 Vendee Globe. The refit required the virtual gutting of the boat and all of its systems; substantial repairs to its stem; an extension to its composite, cored cabin top; removal and modification of the canting keel; and a new deck layout leading all control lines aft to a new pedestal (coffee grinder) winch system; and replacement of its engine, complete electrical system, and all of its electronics. All electronics and wiring were removed and trashed. Original navigation station was cut out and scrapped. A new station was built in lightweight, composite, cored materials. All new navigation electronics, autopilots, sailing instruments, satellite communications and wiring were then installed. A new engine was installed, with high-output charging system, wiring, switches, and monitors. All of this equipment is chosen with keeping weight down firmly in mind. Here is the new engine with high-output charging and all electrical systems installed. Because canting keels pivot on bearings, the keel and bearing assemblies must be removed for inspection and service. In addition, the true weight of the blade and bulb is critical when making modifications to the boat. Here, the keel is being weighed with a load cell to determine actual blade and bulb weight. The keel installed after the refit. A high-tech dodger was installed. This cored, composite cabin top extension provides some shelter when sitting in the cockpit. The original carbon fiber stem fitting was not strong enough to support the headstay pin load of 40 tons, and it failed. Additionally it needed to be modified to fit a new headstay furling unit toggle. The repair required cutting away a section of the bow to expose the solid carbon fiber centerline structure, repairing and modifying the carbon fiber stem fitting, and then rebuilding, fairing, and painting the stem. On Open 60s, the gooseneck fitting is a carbon fiber composite structure attached to the deck, rather than the mast. This arrangement reduces compression loads on the mast, and allows the boom to used as a jury rig should the mast break. The original gooseneck failed, requiring design, fabrication, and installation of a new carbon fiber fitting. Here is the failed gooseneck. New gooseneck ready to install. The rig was modified to accept a new PBO fiber standing rigging package. PBO shrouds are discontinuous and lashed with Vectran lashings at each termination point. There are no turnbuckles. Lower shrouds are lashed to carbon fiber chainplates at deck level. The mast is jacked up with hydraulic pistons and then shimmed to reduce rig tension. After modifications and repairs were made to the deck and gooseneck area, all surfaces were painted with new Awlgrip and non-skid. All Open 60s must prove by empirical testing a positive AVS (angle of vanishing stability) or 128 degrees. 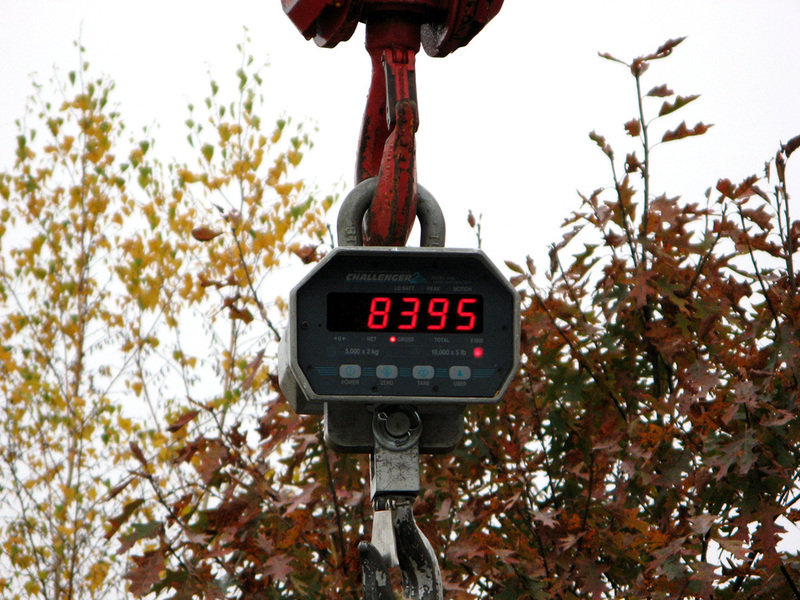 This test is done by first lifting the boat out of the water and taking an accurate weight with a certified load cell. When the boat is out of the water, a strop is passed around the bulb. The boat is lowered back in the water and the crane cable is attached to the strop. The boat is heeled over 90 degrees. With the boat at 90 degrees, a strop is passed around the masthead. A load cell is attached to the strop and to a fixed point, like a skiff. The crane then releases the the load on the keel and the boat is held at 90 degrees by the masthead tether. The force required to do this is then measured on the masthead load cell. By knowing the weight of the boat, the CG and the load at the masthead with the boat at 90 degrees, the AVS can be accurately measured. 121 Days Around the World! Great American III competed in the 2008 Vendee Globe. She placed ninth. Rich Wilson is contemplating another go in 2016.